De GRISOGONO has great hopes from Otturatore, a four faced watch with moving dial. Yes, you read it right. The brand feels the watch will demonstrate the Manufacture’s technical savoir faire and allow it to establish its legitimacy and credibility in the world of horology. That’s what DE GRISOGONO CEO Gerald Roden believes. A timepiece which combines audacity, refinement and modernism, Otturatore’s mobile dial features a sequential display of seconds, date, moon phases and power reserve, with 3 of them always concealed. By a simple manipulation, the sequential mechanism can be displaced by 90° in a few tenths of a millisecond, a speed guaranteed to turn the world of complicated watches upside down. The over-engineered mechanism of the watch can be really amusing and will surely pull in the crowd, if the wearer wants to show off. A square watch, 45mm wide and about 50mm tall, whether its chunky 18k rose or white gold case, the watch uses a lot of metal. And when the 16mm thick timepiece sits on your wrist, it’s like wearing a rod of gold bullion. But there are many who will be enchanted by the interesting mixture of classic watch style meets angular furniture design concept of the Otturatore. The wow factor of the moving dial having registered initially, De GRISOGONO’s latest ensures comfort and legibility. There are pushers on the side of the case (similar to chronograph pushers), but they are used to move the dial window around. Under the dial are four complications, but you can only view one at a time. The watch gives the illusion that the entire dial changes in the flash of an eye. A stealth watch! In fact, a mechanism moves the dial window that is not powered by the push of your hand directly. The top pusher merely activates a special system that cycles the dial window. The watch has a second mainspring barrel aside from the one for the time. It is wound by “pumping” the lower pusher a number of times. When you then press the top pusher it activates the system that draws power from the second mainspring barrel to move the dial window over a new complication. Residing in the watch is the novel De GRISOGONO automatic caliber DR 19-89, which features a subsidiary seconds dial, power reserve indicator, moonphase indicator, as well as date. The dial itself is textured and features nicely proportioned dauphine style hands that are in gold to match the case. The dial is available in a few colours as well including silver, ruthenium, black, and brown. 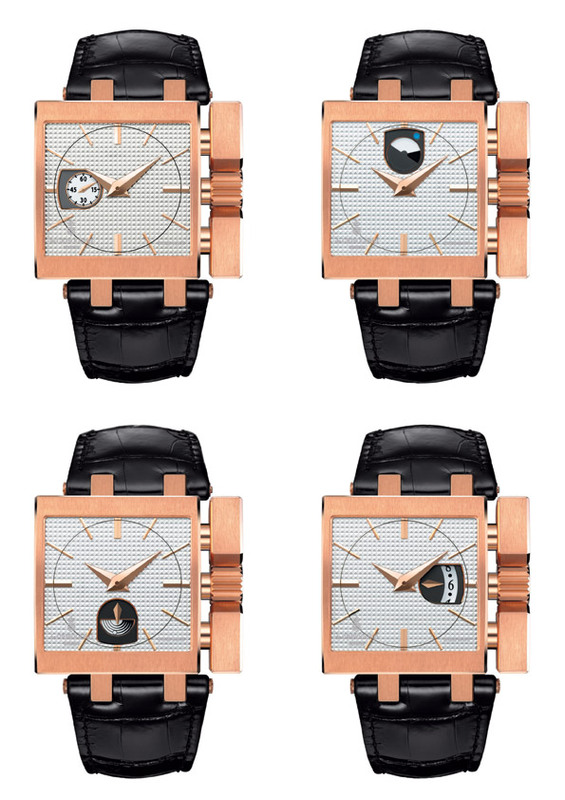 Each of these colours is available with the rose of white gold case. depends on the number of complications or indications of the watch; the Ottaratore’s increment of rotation is 90°. While the principle seems simple enough, its design is totally unprecedented: it propels watchmaking technology from the sphere of slow speeds to that of hyper velocities. A true achievement, indeed. Until now, horological complications focussed mainly on a specific function, usually a matter of actioning a simple sequence of gears or springs. The Otturatore truly embodies another dimension in time. A slight pressure on a pushpiece – whose travel is of the order of one millimeter – is enough to harness enough power to drive the mobile dial by 90° instantly. In a standard mechanical construction, a finger pressing a pushpiece for a brief instant exerts insufficient force to set in motion mechanical components with strong inertial resistance. The Otturatore’s sequential selector can achieve this because it can instantly action the various dynamic functions (controls, connecting and disconnecting operations, mechanical memory, gears and so forth) while taking into account power drain, inertia and friction. The watch is symmetrical and initially a bit intimidating due to the massive pushers and crown but once it settles on the wrist you don’t notice its presence.